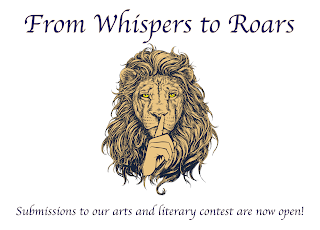 For their third and final publication of the year, From Whispers to Roars presents...The Climax: An Arts and Literary Contest. Submit your work in one of the 4 categories: poetry, fiction, nonfiction, and art/photography. The winner in each category will receive $100, publication in Issue 3, and their work will be posted permanently on our website. Other excellent works will be chosen for publication alongside the winners, which will also appear in Issue 3. Submissions open on September 14th!